I am sure some of you may have seen these before but it was the first one I have seen. It has the phrase that cause Bulova and the Academy Award to have their falling out. Fashion Academy Gold Medal Awarded to Bulova for Outstanding Design. This one is dated 1951. Edit: I think it is a tag not a charm. Very cool, I've never seen one. Do I see the date 1951 on the bottom? Thanks for sharing! Nope, this is the first one I have ever seen. Matches what we know about the fallout. Funny I found two of these at the same time. The other one was with a 50's box and had a burgundy string attached which leads me to believe it was a tag and not a charm. Sadly I missed the end of that auction and got outbid but happy I got this one. Ahh now I see, its gold foil not solid metal...that makes sense as a hang tag. Just my 2¢, but the Academy (AMPAS) might have been a bit over reactive, if this is what set them off. 'Fashion Academy' I'm guessing does not exist, so it was a tongue in cheek reference anyway. I know I've seen posters with the same type of 'award'. I tried to find the threads where we discuss the 'lawsuit', but I found a couple of dead links. hmmm the page URL may have been updated. If you can remember what it/they were let me know the link and I'll check it out. Considering what Buloiva did to help out the Academy I am surprised by the severity of the action they took. A reminder - the Academy of Motion Picture Arts and Sciences AMPAS ( think "The Oscars") did NOT sue Bulova. The company that sued Bulova was called Academy Award Products. It was a company set up for the express purpose of harassing other businesses that were legitimately marketing products under agreements with the AMPAS. 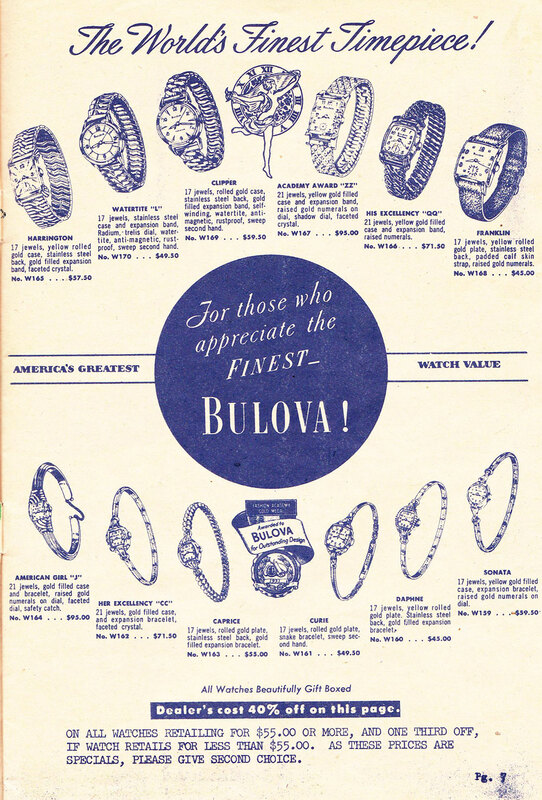 Adjacent to this case, as I understand it but not part of it, was a stipulation by Bulova to the Federal Trade Commission that their watches had NOT been awarded an Oscar for their qualities or designs as the Bulova ads appeared to suggest. Good reminder Geoff, I recall the story better now. I can now say it was definitely a tag. In Shawn's AA watch photos many of his have one. I just never paid too much attention to them before. I might never find a NOS ladies AA so I am glad to have come across this tag. I am working on building at least one complete package. Thanks for clarifying that Geoff! Kathy - Open this advert and expand it. Notice the image in the center of the ladies watches in the bottom row, Look familiar? I had never noticed them in ads before! Looking through I found a couple more too. Yup... we've seen this before. I posted one a few years back with a NOS 1953 Jefferson. The little "medal" is actually gold colored plastic molded piece. Oh very nice! It is cool to see how they were used. HA HA - Jerin, I looked and looked and looked some more because I was CERTAIN that you'd posted about this little 'medal'. I never found it. Figured you'd remember that one Baker! Hah... as soon as I saw it I remember... oh yeah.. that Jefferson had one... of course it was 7 years ago. Interestingly enough - I was cleaning out the watch garage last evening and found one of my own!